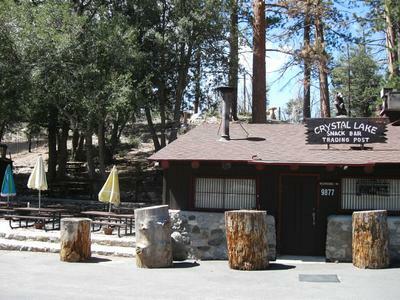 The Crystal Lake trading post, snack bar, and cafe serves up hot and cold meals and drinks every day except for Tuesday. There is a warm stove in the order-and-takeout section of the kitchen and there are a few tables with chairs for people to wait inside as their meals are assembled and served. Outside of the kitchen itself there is a large open patio with six or seven tables next to an array of gas and charcoal grills for outdoor cooking of such things as BBQ chicken and fire-cooked hot dogs. Daily Specials often include a variety of cold sandwiches with different cuts and seasoning that may change from day to day. If we can make something special for you, please ask! The Cafe building is historic, the wonderful rock-and-concrete walls were built a long time ago. Pine trees used to grow on the patio side of the building but over the years tree branches have splintered off and caused damage until eventually the large trees threatened to cause major damage to the store so they had to be removed. The U. S. Forest Service Visitor Center across the parking lot from the Cafe looks today just like it did back in the 1960's, and one can see from the Old Tyme photographs on this web site what the Cafe and Visitor Center used to look like.